As part of our Heritage Lottery Funded project, You Are Hear: sound and a sense of place, we are working with volunteers to install listening benches across Essex. These solar-powered park benches play clips of recordings from the Essex Sound and Video Archive, recordings chosen and put together by our volunteers. 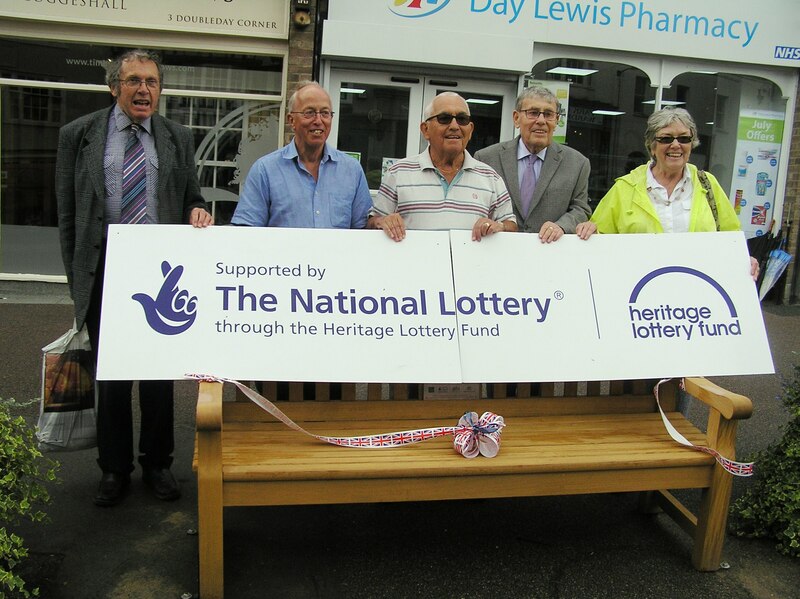 The listening bench for Coggeshall was successfully unveiled on Tuesday 11 July. Each listening bench launch has its own character, but this was the first to include a poetry recital in honour of the bench! 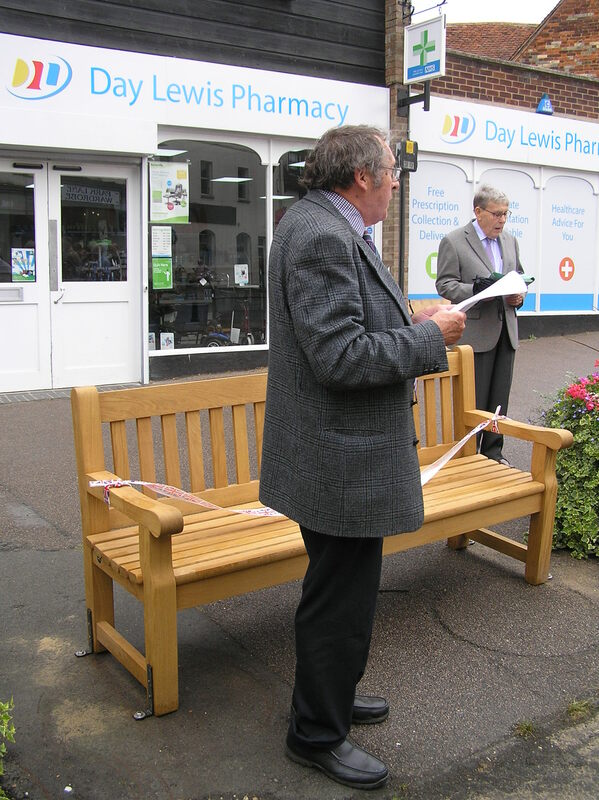 We loved the poem so much that we wanted to reprint it, with an introduction by another volunteer to explain how the Coggeshall bench came about. Back in January I went into the Coggeshall Library, and one of the staff asked me if I knew anyone who’d be interested in setting up a Listening Bench. So I asked what it was, was told, and said, OK, I’ll give it a go. I recruited my friend Nic Johnson, a well known, if fairly new in Coggeshall terms, local resident, and together we enlisted the aid of two more, thought that was enough and presented ourselves to the Essex Record Office. Volunteers who worked on Coggeshall’s listening bench (L-R: Michael Horne, Nic Johnson, Miall James, Stan Haines (who opened the bench), and Sylvie Overnell). One of the two was Michael Horne, a well-known local historian and poet (and Lord of the Manor of Little Coggeshall), who in fact wrote some of what finally went onto the bench; the other was Sylvie Overnell, a retired local teacher, with local contacts. We looked at what was required, divided up the work and got on with it. There were no arguments; we discussed what to do, agreed and got on with it. Indeed it’s wonderful what can be done if no one’s bothered about who gets the credit! Finally, after about five months’ work we were ready, and the bench was ready for use. We recruited Stan Haines, who has lived in the town most of his life, and was Chairman of the Parish Council for 48 years, to officiate at the opening. The only thing that went wrong was the weather on the day, which wasn’t as kind as it might have been! We’ve had some very good feedback, and we feel that, with a little fine-tuning, our Listening Bench will be something our fellow citizens can enjoy for many years to come. To Coggeshall’s newborn Listening Bench. Upon our worthy Listening Bench. Near Coggeshall’s stalwart Listening Bench. Preserved now on the Listening Bench. We’ll still possess our Listening Bench. Will echo from our Listening Bench. Will stay within our Listening Bench. 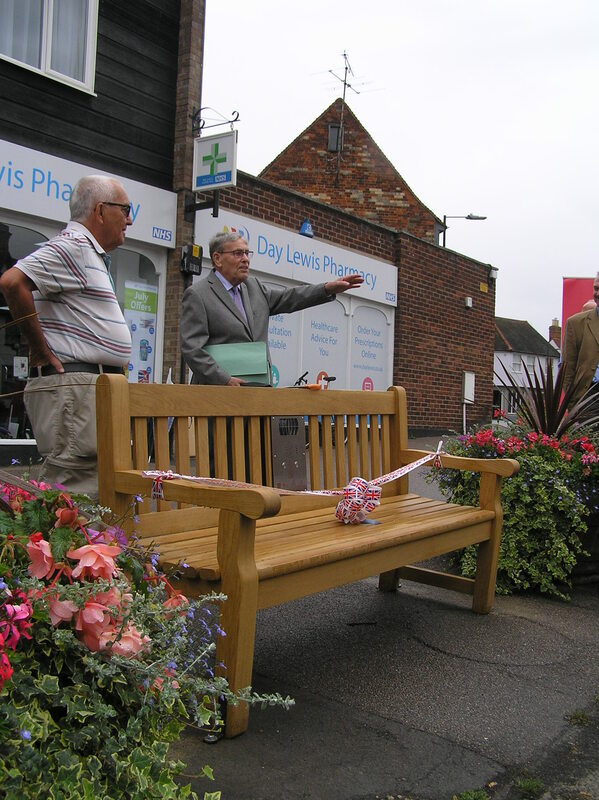 Three cheers for Coggeshall’s Listening Bench! 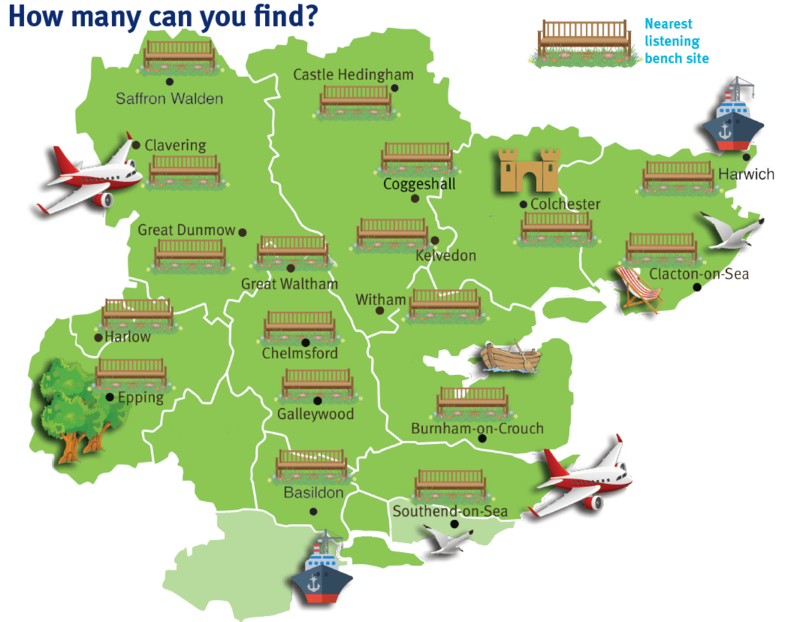 Check our website for details of further listening bench launches, and to keep track of our two touring benches. Can you visit them all? Whether you believe in ghosts or not, it is possible that some may knock on your door at the end of October. 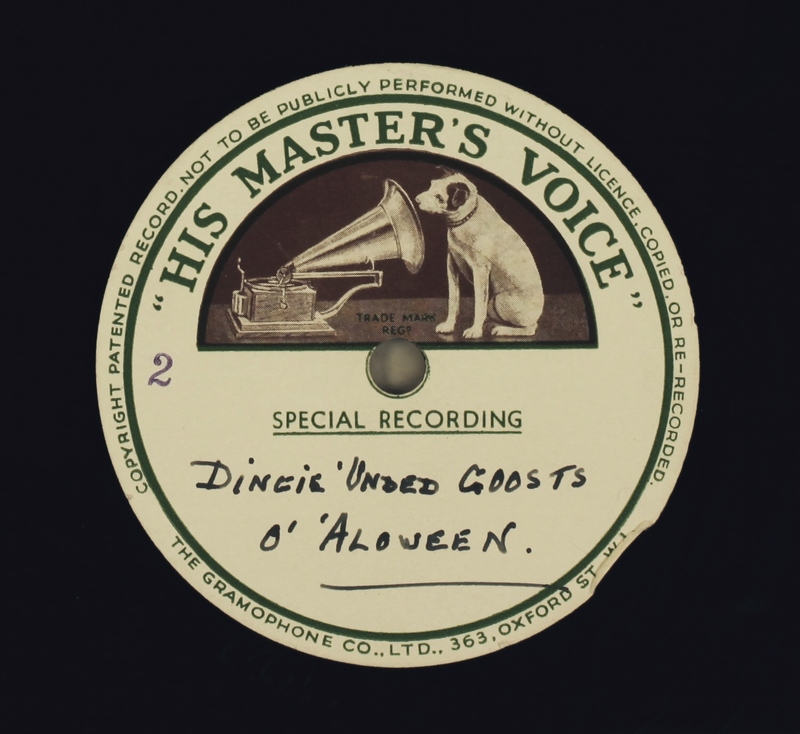 For that reason, I have chosen this ghostly tale – supposedly recounted in Essex dialect – as our recording for this month. 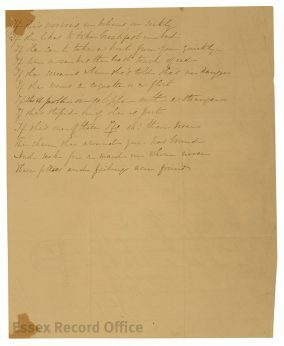 We know that the poem was written (and presumably spoken) by Mr J. London of Collier Row at some point in the first half of the twentieth century. Unfortunately, we know very little else about this delightful curiosity. It tells of supernatural goings-on in Essex’s Dengie peninsula, which is still referred to by the historic term of the Dengie Hundred, and why on ‘’Alloween Eve’ you may still hear ghostly cries as you travel through its misty lanes. According to ‘The Witches of Dengie’ by Eric Maple (published in Folklore, Volume 73, Autumn 1962), “the Hundred of Dengie was until comparatively modern times regarded as ‘Witch Country’, to use a local term for any district where the traditions of witchcraft were very strong.” This article goes on to describe reputed encounters with witches said to have the power of flight – “like other witches of the Essex marshlands” – and a number of tales involving horses and carts affected by witchcraft. One wonders whether Mr London had heard some of these tales before he sat down to compose his tale. 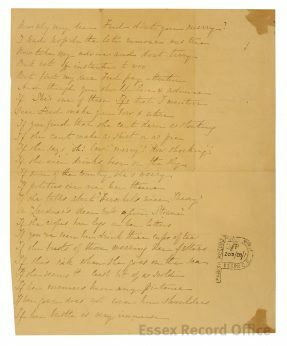 The poem begins: “Should ye ever goo in a pub called Kickin’ Dickey, down Dingie ‘underd way” which is curious as we find no record of a pub with this name in the area. There is a pub called Kicking Dickey in Great Dunmow in Essex, but this is decidedly not in the Dengie Hundred. However, ‘dickey’ is a dialect term for donkey, so could it be that locals used Kickin’ Dickey as a nickname for the White Horse in Southminster, or Mundon, or even the village of Dengie?